Welcome to our second edition of “Legislative Letters”! Here you’ll find updates on policies, litigation, and legislation affecting higher education, and run from the introduction of legislation expanding mental health resources for colleges to the implications of Judge Kavanaugh’s nomination for students. If you have questions, suggestions, or are interested in contributing to the newsletter, or would like to be a part of the Legislative Concerns Committee, please contact the Director of Legislative Affairs, Kaylynne Glover, at legislative@nagps.org. For feedback on the newsletter, you can also follow the link at the end of the Letter to fill out a quick survey. President Trump announced on June 21 intentions to merge the Departments of Education and Labor into a single Department, The Department of Education and the Workforce (DEW) as part of a larger federal reorganization. While Secretary DeVos supports the move, it would require congressional approval, and as of now, reports (here and here) indicate that it doesn’t have enough support. On July 3rd, President Trump reversed an Obama-era policy that allows schools to use race in college admissions. The guidelines were issued in 2011, and contrary to popular belief, did not allow decisions to be made on the race of individuals. Instead, it suggested schools to use generalized race-based approaches, like neighborhood racial composition, if race-neutral methods were ineffective. With the President’s reversal of this move, some schools worry about consequences if they continue the Obama-era guidelines, though many intend to keep their policies in place. Andrew Cuomo, the governor of New York, issued a letter to New York’s university systems to maintain current admission policies that encourage racial diversity and inclusion, and the American Association for the Advancement of Science issued a statement on the importance of increasing diversity in STEM fields. The Department of Education’s Inspector General issued a report saying that the Department of Education gives Universities too much leeway in their accreditation process. Specifically, it states that the policy of allowing Universities to choose the schools to which they are being compared for accreditation purposes could lead to biased conclusions. On July 3rd, Secretary DeVos formally delayed a rule guiding state oversight of online colleges, setting it back two years. The rule would require online colleges to tell students whether the college currently meets accreditation standards. Stating that the rule is currently “burdensome and confusing” for states, DeVos does admit that the delay will negatively impact students. PROSPER, the most recent version of the House’s Higher Education Act, has yet to make it to the House floor, as support for the bill remains weak. House Republicans may be waiting until after Midterms to see what action might be possible before newly-elected House Members take their seats, and we will continue to monitor its progress. Introduced on June 21st, this bill aims to provide more mental health resources to college students. It would create a commission to investigate current services and make recommendations to improve retention rates of enrolled students, and is currently supported by several education and mental health organizations. In May of 2017, the College Transparency Act was introduced to increase transparency on college student outcomes by lifting a ban implemented in the 2008 Higher Education Reauthorization. employment and graduation outcomes of college students. With both bipartisan support and the support of several public higher education organizations, it continues to gain momentum as more senators sign on. At this point, the only apparent resistance comes from Representative Virginia Foxx, chair of the House education committee and author of the 2008 ban. In both House and Senate versions of the National Defense Authorization Act for FY 19 (S. 2987 ) is a measure that would require all Defense Department schools to abide by Title IX requirements. A bill introduced last year would expand the GI Bill which would, among other things, lift time limits on the use of the benefits and prevent colleges from penalizing students due to late payments. The deadline to pass a FY 19 spending bill is fast approaching (October 1), and the most recent effort to pass a “minibus,” a bill combining several smaller spending authorizations, was just halted in committee. This meeting was to be the first attempt to reconcile any of the House and Senate appropriations bills and took place amid threats from President Trump to veto any bill that doesn’t fund his wall. The reason for the committee’s delay is unclear, as sources cite different reasons. 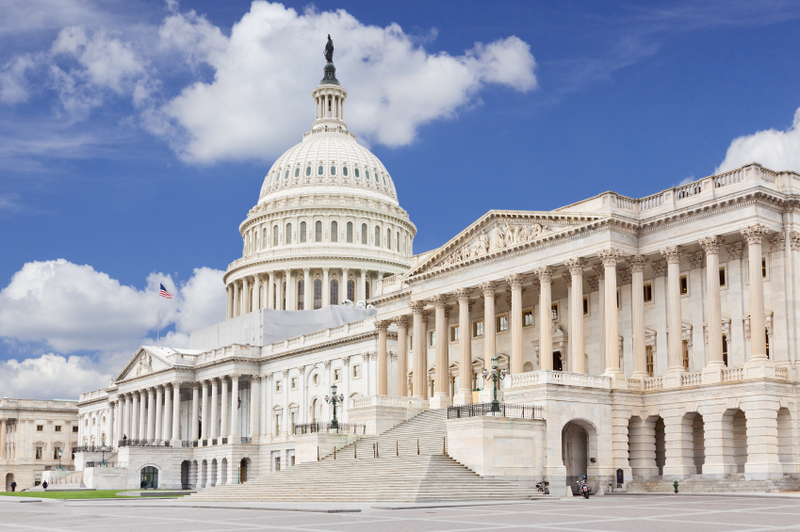 The House education funding bill passed the House Appropriations Committee on July 11th and contains a small increase for the Department of Education and provisions that allow cancer patients to defer federal student loan payments without interest. The Senate version of the bill, which also contains support for labor and health and human services, has passed in the Appropriations Committee and contains a $2.2 billion increase for all three areas, but a slight decrease in Department of Education funding due to Pell grant funding rescissions. As public funding for Colleges and Universities begin dropping, they begin seeking donations from outside sources. Some of those may come through endowments from organizations with their own opinions on how higher education should operate. Student loan continues to be a key political issue. The New America Foundation released a report that contains data on graduate student loans. The current median debt sits at $57,600, and one in four students owes at least $100,000. Litigation continues between advocacy groups, the Department of Education, and Navient, one of the four student loan companies that has contracts with the Department of Education. The Consumer Financial Protection Bureau (CFPB), one of the organizations suing Navient, has accused it of cheating student loan borrowers. The CFPB has issued a letter to a federal judge, stating that the Department of Education refuses to release documents pertinent to the lawsuit. The federal judge has ordered the release of the documents. President Trump’s nominee for the VA Secretary, Robert Wilkie, expressed support for the Public Service Loan Forgiveness program (PSLF) as a “powerful incentive for public service.” He also expressed concern with how GI Bill benefits flow to for-profit colleges; the current guidelines allow these institutions to get additional financial support students who are veterans. President Trump has nominated Brett Kavanaugh to replace Justice Anthony Kennedy on the Supreme Court. Judge Kavanaugh’s record includes several items with implications on education, including support for decreasing separation of church and state, an amicus brief to oppose race-based affirmative action, support for school choice, and criticism of the power of the Consumer Financial Protection Bureau which pursued litigation against for-profit colleges and student loan companies. Representatives from both the National Education Association and the American Federation of Teachers do not believe that Kavanaugh will be be unbiased on rulings. See here for more of Kavanaugh’s track record. Upcoming education-related litigation includes a possible ruling on affirmative action (on Harvard University’s admission policies), and as Justice Kennedy was the swing vote in the last ruling, this may mean that Kavanaugh could have significant impact as to the direction it goes. Kavanaugh has also issued statements and rulings that imply a willingness to compromise, against party lines; compassion for immigration; and a respect for precedent. He has also supported a broad application of obstruction of justice charges for impeachment as well as protection for sitting Presidents from criminal investigations, which may have an interesting impact on President Trump and the Russia investigation. Unsurprisingly, Kavanaugh’s nomination has been supported by conservatives and opposed by liberals, though it is generally accepted that his confirmation will succeed, as liberal opposition to Kavanaugh is divided between a desire to fight for ideology and concerns that opposition would have long-term effects on Midterms. Senate Republicans need a simple majority, which they can do if only one Democrat votes to confirm, which is expected to happen sometime in August or September. A student group, Transparent GMU, at George Mason University sued for access to the University’s agreements with the Charles Koch Foundation. Judge John Tran ruled that the Virginia Freedom of Information Act does not apply to the Koch Foundation as it is a private entity. The student group plans to appeal. A recent policy change in the USCIS may have serious impacts on international students studying in the US. Issued on June 28th, this change would expand the ability of the USCIS to issue a “Notice to Appear,” the first step in deportation proceedings. Historically, USCIS would refer cases to ICE which would then determine whether to issue an NTA. This may affect students due to a second policy, going into effect on August 9th, that would allow NTAs to be issued to students for any violation of student status – violations that might be caused, for example, by a school’s failure to update their record. Students may be unaware that their status is in danger until they are issued an NTA. Midterm elections are this November, and with it, all 435 Congressional Districts for the House and 35 of the 100 Senate seats will be open. Senate republicans currently have a one seat majority, 218 seats are needed for control of the House. For more information, see these interactive maps of the House and the Senate. Find out more who is running and about current Congress members’ history, voting records, committee assignments, and legislation. Our Letter is new off-the-ground, and we would really appreciate your thoughts on it – after all, it’s for you! So please follow this link to fill out a quick survey so that we can best meet your needs.